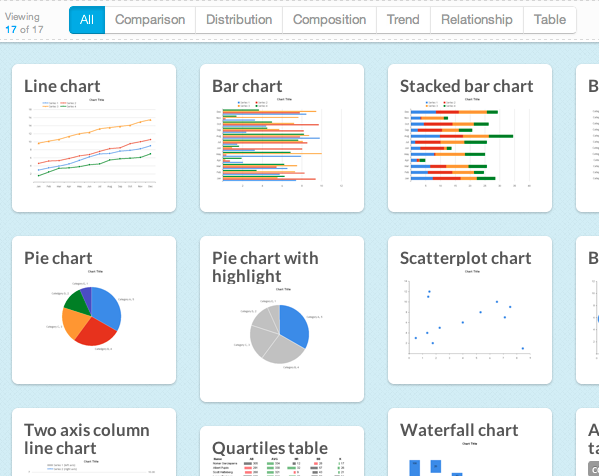 Introducing Chart Chooser -- V2! Over the years, our Chart Chooser website has gained fairly significant attention from folks like Jason Shen, O’Reilly Radar, and Lifehacker. But more importantly, it has gained notoriety from folks like you who have loved it and used it to have better conversations with data -- and that’s what really gets our hearts pumping. So, as thanks for making Chart Chooser one of our most popular creations, we decided it is time for a remake. Introducting Chart Chooser Version 2! If you’re new to Chart Chooser, it helps you identify the right chart based on what you are trying to show, and then lets you download the Excel or PowerPoint version of that chart to help you get your job done -- all in Tufte-compliant style. We’ve remade this free tool using HTML (Version 1 was written in Flash which is oh, so last year) and have improved the navigation and filtering. Additionally, we’ve been working on some pretty cool things in the Juice Labs and the new framework will enable us to add the best of these creations for you all to see and use -- stay tuned! So, are you ready? Give it a click and choose your chart to your heart’s content! Older PostGot Data Viz, Y'all?